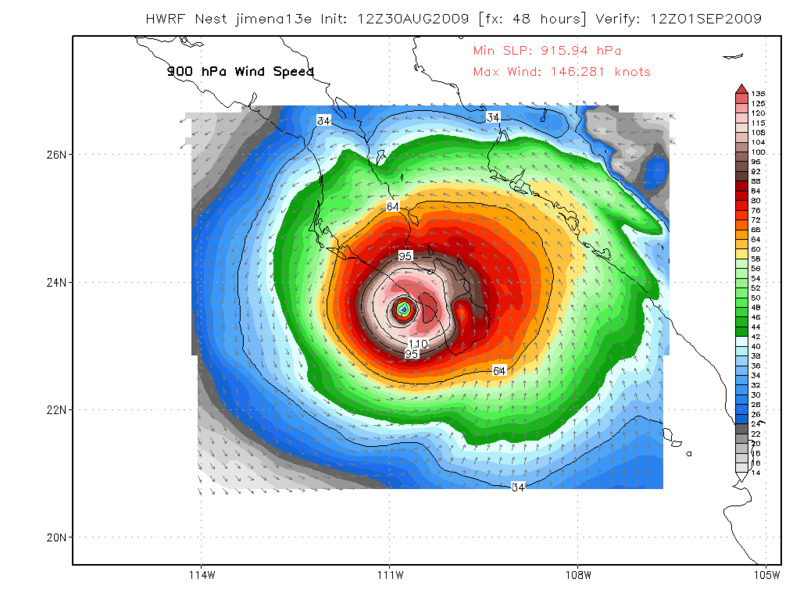 I wouldn't want to be on a Baja California vacation Wednesday! You definitely want to click on the image to get a better view here; it’s the 48 hour forecast from the HWRF (Hurricane weather research forecast) model. Note the 915 mb sea level pressure in the eye of Hurricane Jimena, plus the 145+kts of wind wrapping around the storm as it runs directly into the southern tip of Baja California. I have never been down there, but I always hear about the resort-studded area on the southern tip of the peninsula. Apparently it’s quite nice…maybe not after Wednesday. Just remember that like all other big weather events we discuss on these pages, this is just one model. But I notice the GFDL is similar. Other models swing it farther offshore. Right now it is a Category 4 storm. 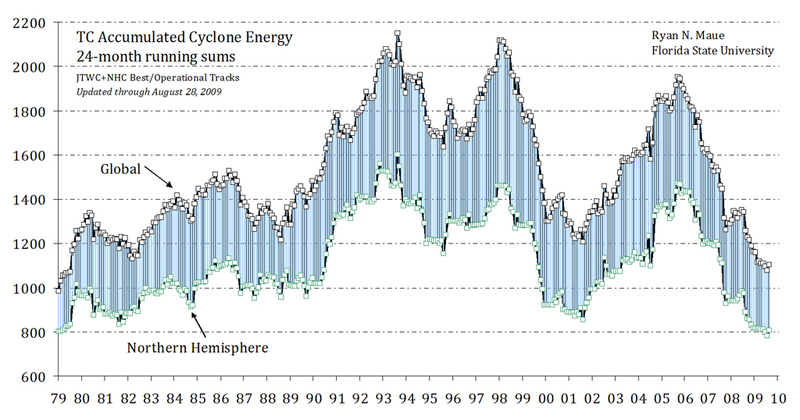 I found this almost as interesting: it’s a global & northern hemisphere plot of the last 30 years “tropical cyclone energy”. It shows that we are at a 30 year low in that energy…basically it’s been unusually quiet the last few years in the tropics. That would be when averaged over the entire globe. Last year it was above normal in the Atlantic but quieter elsewhere. There is some fascinating reading at the link I’ve highlighted, and of course the chart is easier to read when you click on it. Back here in the Pacific Northwest; it’s a working weekend for me since Stephanie Kralevich did the Hood to Coast Race. We have a week of changes here in the weather center. Today was Stephanie Ortmann’s last day, we wish her good luck in the future of course. Brian MacMillan begins tomorrow afternoon, and Rob Martin’s last day is on Thursday. Hopefully it hasn’t been my boring-weather-fueled fits of incessant rage and anger that drive people out of here??? Unlikely. Very nice weather the next few days before a big change to cool and showery right around Thursday. Holy cow…I wake up to sunshine this morning, which isn’t unexpected, but it looks like the tropics have moved in next door. 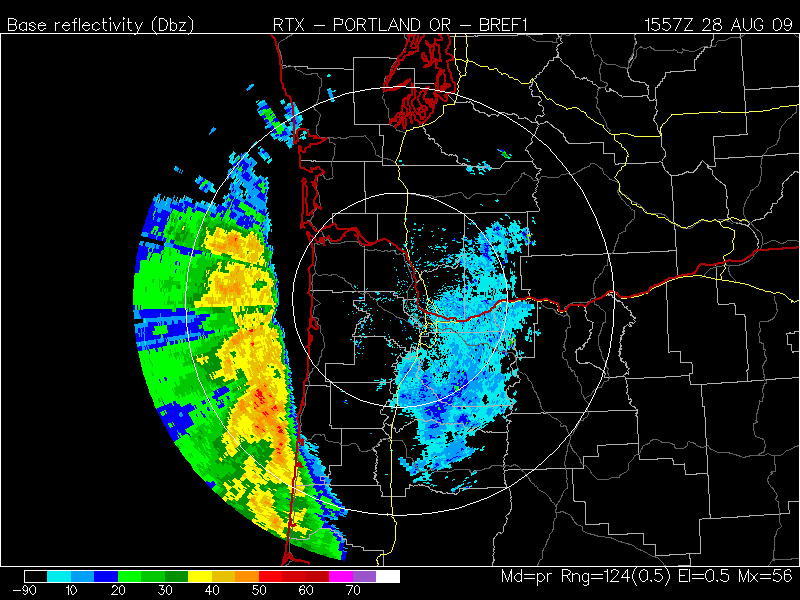 Those of you that regularly check out the Portland radar know that it’s rare to see such heavy rainfall in a solid band so far away from the radar site. Too bad it’s not about 50 miles east or we’d be getting heavy rain this morning along with some embedded thunderstorms. Yesterday evening’s models, along with the 12z NAM say it’s going to fall apart by the time the upper level trough swings through this afternoon. Hard to believe,but we’ll see. 4:30pm Update: And…now we have seen. Is this pathetic or what? Looks like a few hundreths at best with the quickly dying band of rain heading through the Metro area. Models did pretty well apparently. 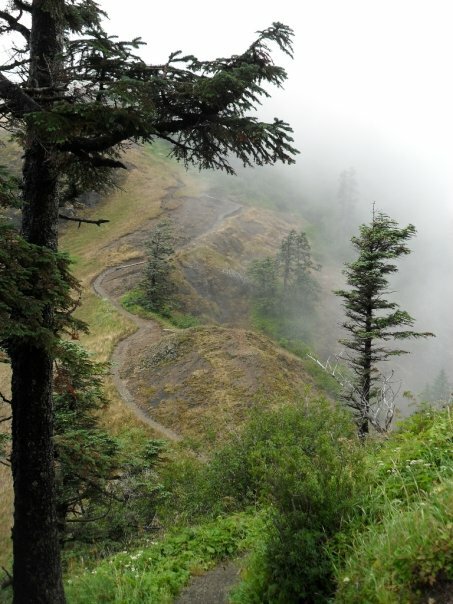 This nice picture taken from the Saddle Mountain trail in the north Coast Range comes from Mike Ramey. He works in production here at KPTV. He’s been harrassing me for days, asking when I’m going to show his picture…so I’ll do it on a day that he’s gone! Nice play of fog with the trees on a cool summer afternoon. I think the picture is about two weeks old. Not much to talk about this evening. It looks like summer is back for the long term, minus a trough passage on Friday. We made it to 85 degrees today, right on the forecast mark. We had light offshore flow today…notice the 81 degree high at Astoria! So I figure 5 degrees of warming tomorrow with a warmer airmass still looks good. Decent chance for showers on Friday now with a trough passing through, then recovery over the weekend, although the trough lingers just to our east. I took a nice bike ride between the 5pm and 10pm shows tonight. Up into the West Hills via Germantown Rd. and Cornell. Real nice & smooth road; quit a change after bumping along on dusty trails while on vacation. I sure noticed the change in evening light within the last two weeks. By 7:45pm it was starting to get a bit dim already. 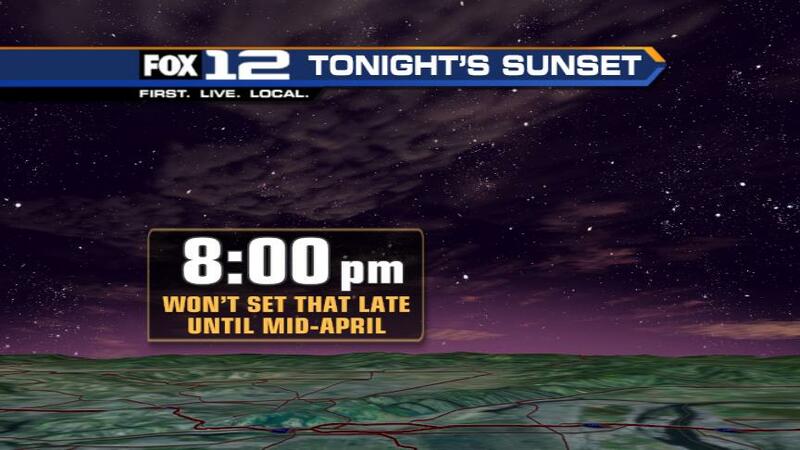 I see we’re moving back into the 7 o’clock hour sunsets again too. Seems like the seasons moves faster and faster as we get older. Remember when you were a kid and couldn’t conceive of the time required to pass from one Christmas to the next? Speaking of Christmas…I see El Nino conditions are still looking likely for this upcoming winter. You can click on the image for a much better view. The Climate Prediction Center models all seem to peak out the intensity in the November-January timeframe. Quite a range on intensity though. Just a few go for weak to neutral conditions; at the other extreme some have a very strong event developing. None flip it to a La Nina. 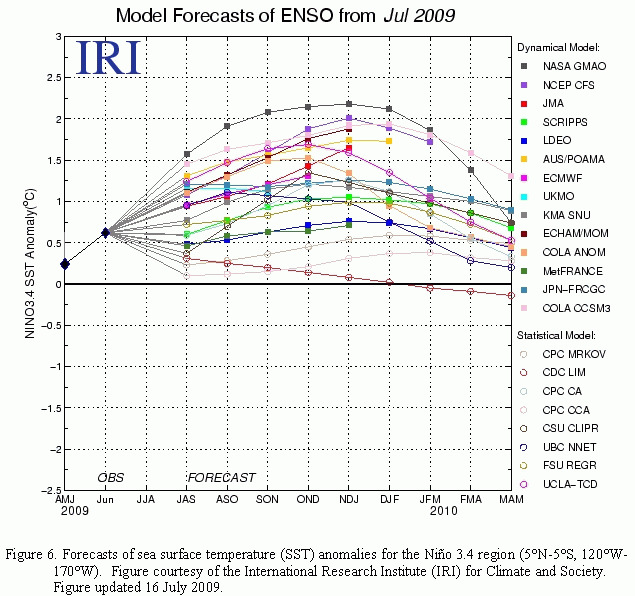 The consensus is for at least a moderate El Nino for this upcoming winter. The models (and CPC) did pretty well with La Nina, so we’ll see what happens this time. 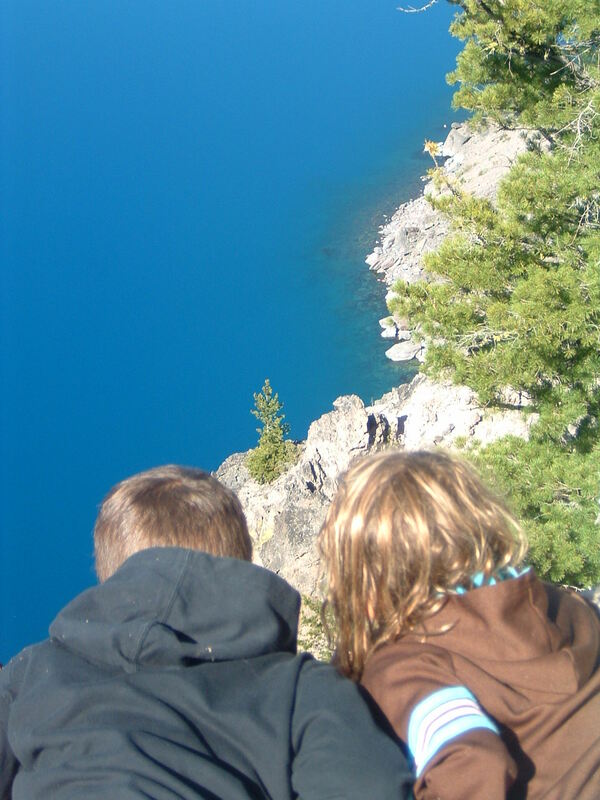 The Nelsen kids checking out Crater Lake. The lake is actually at least 2,000' below although it looks quite a bit closer. Nice view of the quick dropoff in the landscape under the water. Finally, after about 30 years, I took the boat tour. We found the "Old Man of the Lake"! I’ve got a few pictures here from this past week’s vacation. It was one of those “perfect” vacations where I had no contact with the outside world (okay, one cell phone call) from Saturday through the following Friday morning. My family and I spent 3 nights at Diamond Lake, near Crater Lake. Then we headed up to Waldo Lake for three nights in our little “Craigslist” travel trailer. 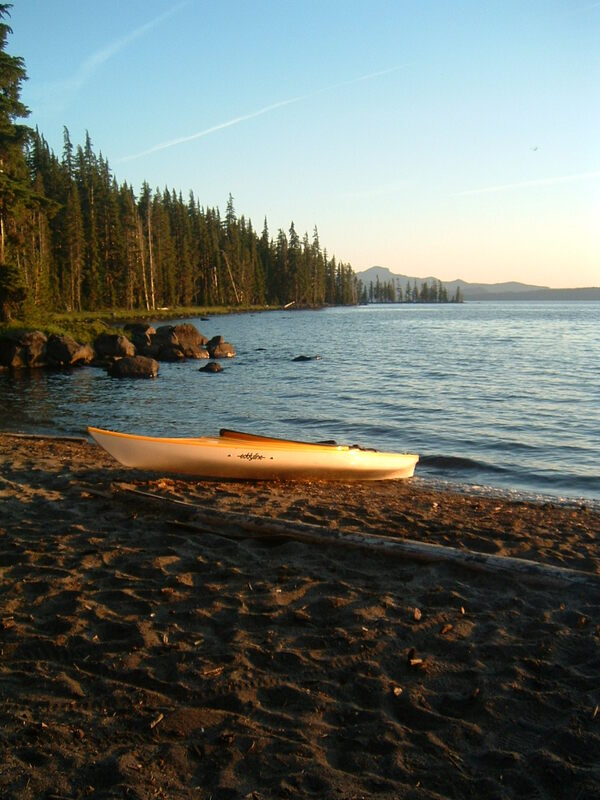 To me camping at a Cascade Lake campground is probably the pinnacle of the Pacific Northwest experience. You’ve got all our native hemlocks, douglas fir, noble firs and other trees smelling up the air real nicely. The lakes are usually pretty clean, and mosquitoes come after you with a vengeance in the evening or anytime the breeze stops. Crater Lake was incredibly blue this time, more than I remembered…probably because of a very blue sky and no haze. I wasn’t aware that it’s okay to swim in the lake…I’ll make sure I bring the swimsuit next time even though it’s real cold. Also I had never heard about the Old Man of the Lake. A solitary tree that’s been floating around in the lake (upright) for over 100 years! The link can tell you more about it. Not the best picture, but you get the idea. 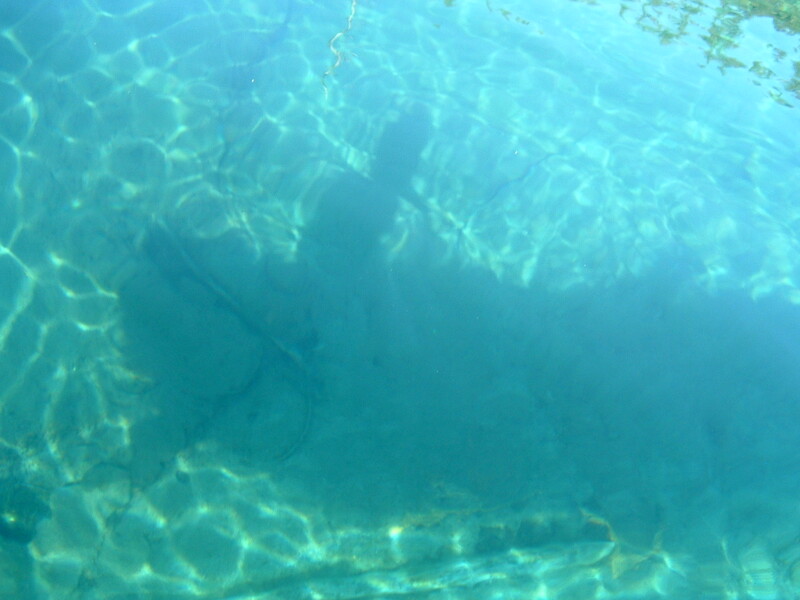 Waldo Lake's water is incredibly clear...this is my shadow (in the inflatable kayak) down into about 15' of water! 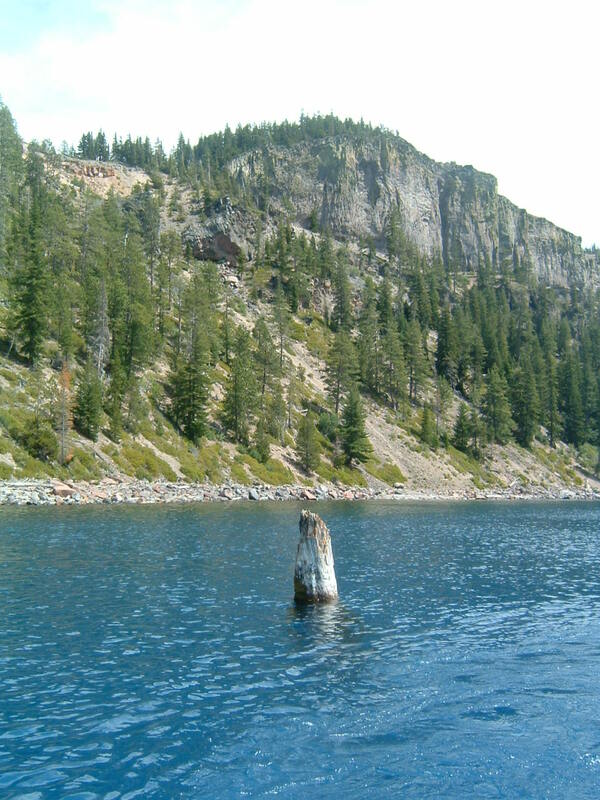 Waldo Lake is a hidden treasure that I also didn’t know much about. It’s located about 15 miles north of Willamette Pass. Apparently it’s one of the clearest lakes in the world, second only to Crater Lake here in Oregon. There is so little “life” in the water that the purity is similar to distilled water. No gas motors are allowed on the lake, so it’s a real kayaking/canoeing/sailing place…very quiet. Your first thought on seeing the water close up is “wow…those blues and greens are incredible!”. I measured 67 degrees even a few feet down in the water, which was warm enough for snorkeling on a hot day. The colorful experience was similar to snorkeling in Hawaii, except for no signs of life, just some occasional mossy/algae spots. Riding a bike through the standing dead forest of the huge Charleton Burn of 1996 was neat too; that’s along the north shore of the lake. All good things have to come to an end, but at least it’s back to a job I enjoy. Quite a roller coaster weatherwise the next few days. A quick trough swinging by tomorrow cools us off, then the next trough digs well offshore pushing a hot ridge up over the Pacific Northwest for a few days. A nice stretch of summer weather will finish out the month of August. Some of you may be tired of the hot weather, but we’ve seen plenty of gloomy days inbetween the hot ones as well, plus the long rainy periods of Fall and Winter can’t be too far off right? I’ve been on vacation for the last week, but will be back tonight. I’ve sucked the vacation “well” dry, so just a day or two off at a time between now and March. But I talked to Rob late last week…what a disappointment for us but a great deal for him! Rob was a weather intern at KPTV about 4 years ago, then finished college and came back to work for us last Fall. I figured he would fly the coop at some point but hoped it would be a bit farther in the future. He’s a great employee and friend; we’ve had many long discussions about weather patterns and other geeky things. He’ll be missed. I have to admit that I’m slightly jealous. I first applied for on-air jobs in 1991 right out of college. I grew up here in the Pacific Northwest and REALLY wanted to go somewhere back east to live in and forecast thunderstorms and blizzards (far more active weather), plus I’ve always had a soft spot for agriculture and small towns. But I couldn’t get anyone to hire me in little places such as: Fargo, North Platte, Kearney NE, or Kirksville, MO. Instead I took a job for a small company here in Portland that forecast wind for windsurfers in the Columbia Gorge for the next two years. By chance I got that job at KOIN, so I never did get a stab at the wild weather in the Midwest. Yes, I was lucky to start working in a large TV market, but Rob is doing the right thing by getting some experience in a small “market” first. So we have all heard that we have a new weekend weather guy starting fairly soon. If not see Marks post about it (maybe a week ago). He is really awesome and is going to be present here on the Blog from what I hear. Well, I have my own news to contribute, I have taken a job in North Dakota doing weekend weather. I have loved every minute I’ve spent at Fox12 and without them I would not have this new opportunity. I thank them for that. I will still continue to read this blog, and maybe write some replies, but this time as a viewer! I am really excited about my new job, which I will be starting in early September. The new station has an awesome weather team that I should fit right in with. And for all of you blog followers, I want to thank you for welcoming me and the years of entertainment. Yes I read this thing long before I worked here. I’m a weather geek, what can I say! Now for something more weather related, wow it’s cold out there right now, midday and only 68! I was able to fly in Air12 today and we ran into some decent rain over parts of the valley. There was some pretty low cloud cover so we had to fly over Lake Oswego to get into downtown. And driving home from the station it was misting really hard, especially near Sylvan. Did anyone else see some form of H2O fall from the sky today? And from the Sat , or looking up 🙂 we still have some decent clouds trapped in the valley. I am not sure how much clearing we will get now. You are currently browsing the FOX 12 Weather Blog blog archives for August, 2009.